1. Solar power is truly a vast energy source; it takes only 14.5 seconds of solar radiation to power global energy consumption for a whole day! Taking advantage of solar energy as an alternative energy source, we can rely on free, abundant solar potential to provide for our energy needs. 2. Solar energy systems for residential applications consist of six main parts: Solar (PV) panels, Inverters, batteries, charge controllers and supportive structure with cabling. PV panels are exposed to sunlight to generate electricity (DC current). Inverters are used to transform generated electricity in a usable form (DC to AC). Batteries are connected to gather and store excess electricity that is not used immediately and charge controllers ensure even battery charging. Cabling and supportive structure is used to integrate the system in circuit and support the whole system. 3. Depending on your location’s solar irradiance a 1-kw installed capacity of solar panels will generate between 1500 to 1800 kwh within a year. This set up may consist of 10 solar panels with a total area of 100 sq.ft. 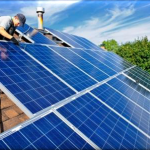 Solar panel companies can provide specs and prices regarding solar panels’ efficiency, life span, panels size and cost. 4. The 1 kw home Solar PV system can prevent approximately 890 kg CO2 from being emitted into the atmosphere or prevent burning 150 pounds of fuel-coal. 5. Batteries are used to store generated electric energy and dispatch it on demand; the batteries act as a buffer of electrical energy to smooth-out demand and supply fluctuations. Energy that is generated when the sun is shining can be stored (in certain amounts and for some time) to be used when the sun is not shining (e.g. when cloudy or at night). 6. Apart from direct consumption, solar energy can be fed onto the power grid under the FITs (feed in tariff) subsidy scheme; depending on the subsidy plan this may entail selling electricity to the utility company or collecting credit money in kwh. 7. Additional financial incentives for solar energy may contain tax credits from federal or local government. 8. Solar panel manufacturers can provide a warranty of PV operation of up to 25 years; current efficiency levels may entail maximum 10% efficiency loss in the first 10 years of operation and max 20% loss for the next 10 years. 9. 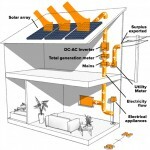 There are various Solar energy systems that can be used in residential applications; these include Photovoltaic (PV) panels, that generate electricity either for own consumption or for the grid, Solar heaters, that provide hot water for domestic use or for space heating, or other solar lighting, that collect sunlight to light residential or industrial places via fibre optics.